So after Thanksgiving, cranberries were on super sale so I bought 2 bags for $3.....then let them sit in my fridge for a week. I've never cooked or baked with them before and all the beautiful recipes on Pinterest were too hard to choose between. I used one bag in a fruit crumble, but I didn't cut up the cranberries and they were a little too tart. For my next recipe, I wanted something delicious, sweeter, and with a holiday feel. I decided to create a recipe that would be perfect for breakfast Christmas morning. My mom always makes a sour cream coffee cake so I decided to make sour cream cranberry and orange muffins. 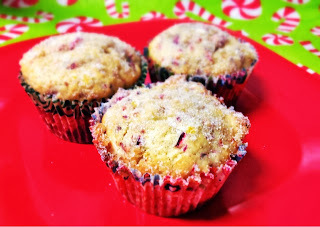 Get ready for a delicious and sweet muffin that tastes are perfect for your Christmas brunch! Preheat oven to 400 degrees and line muffin tin with muffin cups. Cream butter and sugar together. Add in eggs and almond extract. Fold in sour cream. In a separate bowl, mix together flour, baking powder, baking soda, and cinnamon. Add the dry ingredients to the wet until just combined. Fold in chopped cranberries and 1/2 of the zest of the medium orange. Spoon batter into muffin cups and bake 18-22 minutes. In a small saucepan, simmer the rest of the sugar (1/4c) with the juice of the medium orange (about 1/4 c) and the rest of the orange zest. Let the muffins cool for 5 minutes and then brush them with the sugar/orange glaze. After they are glazed, dip in the orange sugar. Best served warm! *You can chop the cranberries or put them in a food processor for a few seconds! 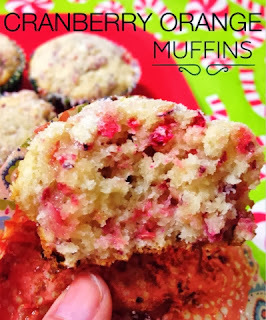 Cranberry stains easily so the food processor is less of a mess.